Although there are exceptions, there are two basic conditions to make really good Crémant d'Alsace: Chardonnay and long storage sur lattes . Chardonnay makes the wine crisp and elegant. Sur lattes is the period when the second fermentation takes place in the bottle, when the mousse is formed and dead yeast is broken down so that the wine gets its' complexity. In Alsace, the wine should pas at least nine monthssur lattes which is way too short. Crémant from Charles Baur in Eguisheim spends 36 months sur lattes and has an aroma of toasted bread, citrus, ripe apple and cola beans. The taste is balanced with a fine structure, and the eight grams of residual sugar is easily supported by the fresh acidity. Price: € 9. 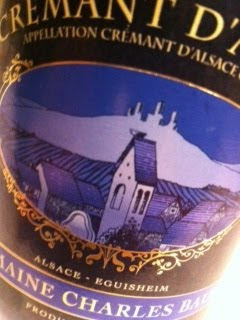 Odile is an important name in Alsace since Sainte Odile is the patron saint of Alsace. She was born blind in 662 A.D., as the daughter of her cruel father Etichon, Duke of Alsace. During her time on earth she managed to bring back her brother from the dead, regain her own sight through prayers and make her father build a monastery in Hohwald close to Andlau, southwest of Strasbourg. Odile was canonized 1807. 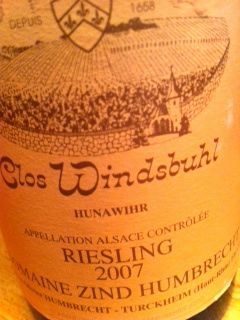 2007 Gewurztraminer Grand Cru Pfersigberg 2007 by Odile Weber in Eguisheim offers a fresh nose with lilac, minerals, ripe stone fruits and honey. The taste is medium bodied and elegant with savoury fruit, supported by high acidity and a minerality typical of the terroir. Really good! Price: € 12.